If you are anything like me then you are probably always on the hunt for a perfect post workout snack. I personally don’t feel very satisfied with a shake after a run or workout, it just doesn’t satisfy me for very long and I am reaching for something else. 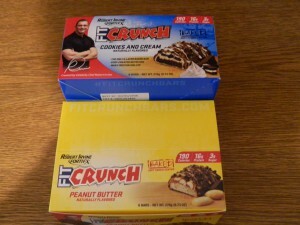 I was given the opportunity to try Chef Irvine’s Fit Crunch Baked Bars recently, and of course I jumped on it. I am a huge Restaurant Impossible fan, and I know Chef Irvine takes health and fitness serious. I mean have you seen this guys arms! As a chef he also prides himself on nothing but the best product coming out of the kitchen. 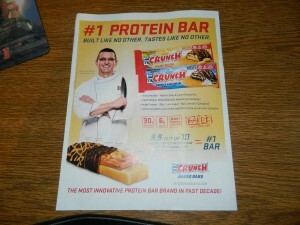 I would have to say he hit it out of the park with this FIRST ever BAKED protein bar, yup baked. Oh I’m sorry I forgot to mention that these are made right here in the USA! Go Chef Irvine! Bringing the first ever baked protein bar to the market is a game changer. Each snack bar has 30g of protein, a mere 6g of sugar and is ONLY 190 calories. Now for the taste, because we all know that some of these fitness products taste like chalk! I am not a Peanut Butter and Chocolate person (gasp, yes I know) so I opted for the Cookies and Cream Bar. Let me tell you, I LOVED it. And I’m not just saying that. These bars taste like a sweet treat from the kitchen not a fitness bar, and the fact that it is baked makes it that much better. You would never know this delicious bar is packed full of Whey Protein Isolate because it tastes just that good. Chef Irvine also offers a Meal Bar with 380 calories and still only 6g of sugar and a WHOPPING 30g of protein. I can’t wait for more flavors to come to the market. Wondering where you can purchase these fantastic bars? Well you can order them online at Fit Crunch Bars website. Or you can visit GNC, Wal-Mart, Rutters or 7-Eleven to pick up yours now. I am definitely taking some of these with me for Princess Half Marathon Weekend in February, I would rather eat this post race snack than a churro. Chef Irvine was kind enough to send me a few extra bars so I can host a GIVEAWAY for my readers!! 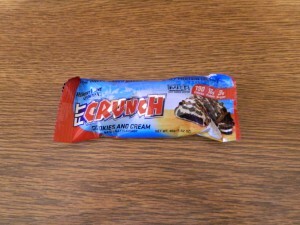 Just comment on this post what flavor bar you would love to try (Cookies and Cream or Peanut Butter and Chocolate) and I will pick a Winner via Random.Org from all of the posts on Sept 13!